National Night Out (NNO) is more than turning on your porch light the first Tuesday in August. It’s neighborhoods forming a cohesive bond to keep trust in and crime out. National Night Out actually grew out of a Community Watch program near Philadelphia. In conjunction with his local police force, Matt Peskin founded National Association of Town Watch (NATW) in 1981 to provide communities with pertinent information to help them stay knowledgeable and safe. Peskin took it a step further, introducing National Night Out in August of 1984. Since he had law enforcement and neighborhood watch, civic and crime prevention groups already in place through NATW, the first annual National Night Out saw 2.5 million neighbors in 400 communities in 23 U.S. states come together in the form of festivals, parades, block parties and cookouts as well as “safety demonstrations, seminars, youth events, visits from emergency personnel, exhibits and much, much more,” according to natw.org. Today, 38.5 million neighbors in more than 16,142 U.S. communities, Canadian cities and military bases around the world take part in National Night Out. Locally, Sergeant Chris Friguglietti serves in the Community Outreach & Education Unit, Special Operations Division, for the Concord Police Department. He is the go-to person for Concord neighborhoods. This year, the Concord Police Department asks that each residence leave its porch light on, at least from 7:00 to 10:00pm, on August 1. The porch light symbolizes both a welcome and a signal of awareness. The department also suggests introducing yourself to neighbors you haven’t met before. For more information or if your neighborhood would like to host a NNO block party or other activity, please contact Sergeant Friguglietti by July 15. He can be reached at 704-920-5063 or friguglc@concordnc.gov. Additional information may also be found at nno.org. This is the first year that the City of Kannapolis is hosting a National Night Out celebration. 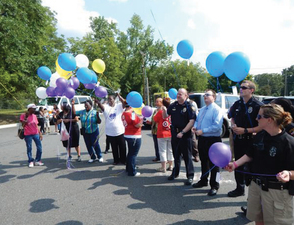 Like other communities, NNO events have been planned and hosted by individual neighborhoods. Kannapolis invites everyone – including neighborhood associations, community groups and HOAs – to Veterans Park from 6:00 to 8:00pm on August 1. Food, children’s games, and interaction with the city’s police and fire department staff and community partners are part of the planned festivities.